Over two months I’ve been at Rockpool twice (one for dinner and the second for lunch. The second time was better than the first. Why? Because I didn’t know my steak! I had the wagyu topside the first time and it was too chewy! 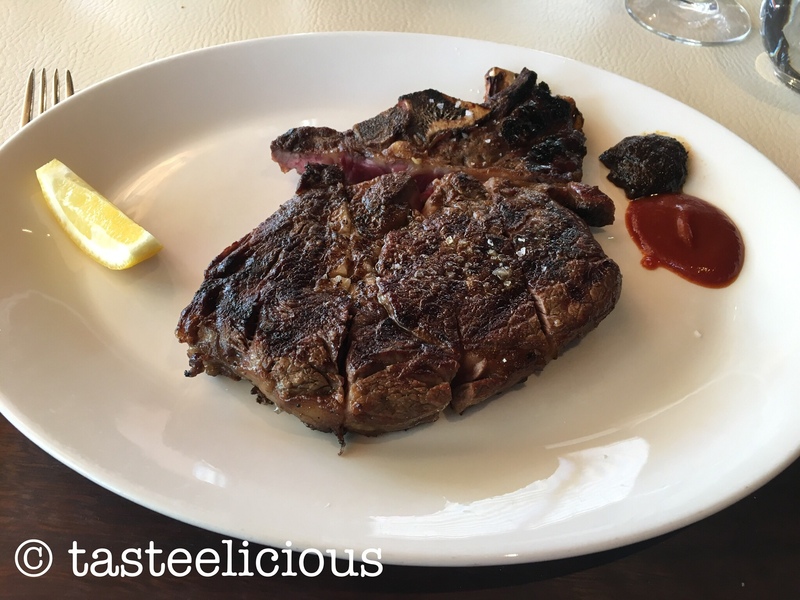 I was so disappointed until I tried J’s scotch fillet around 60 days old and I loved. Rockpool made it crispy on the outside and medium rare inside. Perfect! Even though the steak was good on its own, it was beautiful with their condiment sauces. I love their BBQ sauce. Housemade and I ask for it the both times I’ve seen it. Our entree was cured salmon with yuzu. The fish was tasteless. The size of the pieces were very small that the taste didn’t get through to the fish. Yuzu was there but it was missing something to tie it together. Our sides were roasted pumpkin with sweet potato and garlic yoghurt and burnt butter. It looked burnt BUT that was mouth watering! Each mouthful melted in my mouth. Crispy enough on the outside. Something simple but a stand out – worth trying. Second time I visited (I learnt my lesson), so I ordered the scotch fillet. Every day the chef will bring out certain number of days old steak where they think is ready to consume. So everyday is going to be different! We also tried their other dishes and they were delicious especially their wagyu bolognese with hand cut fettuccine. We mentioned that it was a shared dish and the chef separated the dish into two. It was a generous portion because it looked like one serving from my plate! Their mocktail drinks were lovely. Very refreshing and would recommend it for a nice hot day. Decor and atmosphere was pretty good. Dark but can still see what I am eating. Not like other fine dining restaurants where all I can see is the candle.